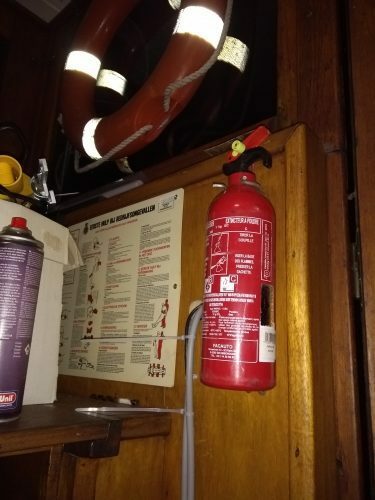 22nd January 2018 – Navigation lights are running, so is the blue board, the horn, the radio’s and much more! My 12v circuit is working. It feels good to know that another thing on my list is done. Next thing is to clean up the engine room and get the engine running. 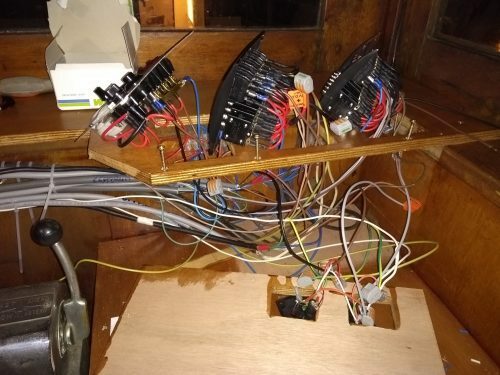 12th January 2018 – All the wires in the wheelhouse had to be connected to three switch panels. Maybe a mistake I made, I should have counted how many instruments I had because three panels aren’t really enough. It took us several hours to get it all connected. Testing will be for another moment. 10th January 2018 – Just unloaded three fuel drums to put clean fuel in, while I can clean my tank for the journey in May. I removed some rubbish from the engine room, it starts to look clean. Once the bulkhead is finished, I can do some updates on the paintwork. 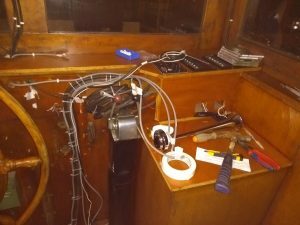 9th January 2018 – When I came back from Tordino, I drilled two more holes through the wheelhouse to put some cables into the engine room. It is a very busy week and I wouldn’t know any other moment where I could do it. On Friday, we start connecting the cables to the batteries. I spent most of the day in the wheelhouse. A few more cables had to be pulled through the floor. I mounted a second life ring, my life jackets and ropes around the other life rings. Some cleaning was done and now it is again possible to walk in the wheelhouse! 1st January 2018 – Last night, there was a New Year’s Eve Party aboard the Watergeus. Several friends came. It was the first party in over a year on this ship. I had been so busy the last year, I nearly forgot to party. When we walked out the ship, water was extremely high. I’ve know it high, but this was exceptional! 28th November 2017 – I managed to finish most of my cables. Only a few more need to done. I just ordered my two VHF radios and a set of antennas. Once they are delivered, I can finish the panels and hopefully, everything will work. 26th November 2017 – I drilled a few wholes so I can put through the wires for the bilge pumps and other equipment down in the engine room. 14th November 2017 – Two big machines: the Solar Panel controller and the inverter are now hanging in the engine room. It took much more time then expected to bolt them in the bulkhead. I had to ran several times between the two compartments, running up and down the stairs to tighten the bolts. 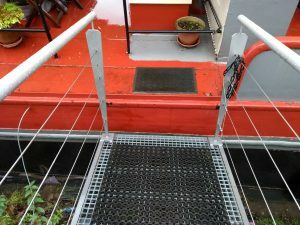 13th November 2017 – I mounted the first cable gutter in the engine room. The cables need to run tightly and clean, not like it used to be, around everything and everywhere. I don’t want to think yet how many cables that will be running through the engine room, but with all the equipment, there will be a lot! Two power cables are running from the battery. One of them is spare or in case I need another set of batteries. 7th November 2017 – I just taped a bit of my roof with aluminum tape. It will hold for now and at least it should stop the water from coming in and the wood can now start to dry out. 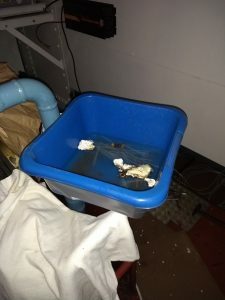 6th November 2017 – It was still leaking. I think water is coming from somewhere else…. 5th November 2017 – Soon after getting up, I checked the wheelhouse. Dry on the side, but a new leak one meter further. With the remaining silicon, I managed to do something.